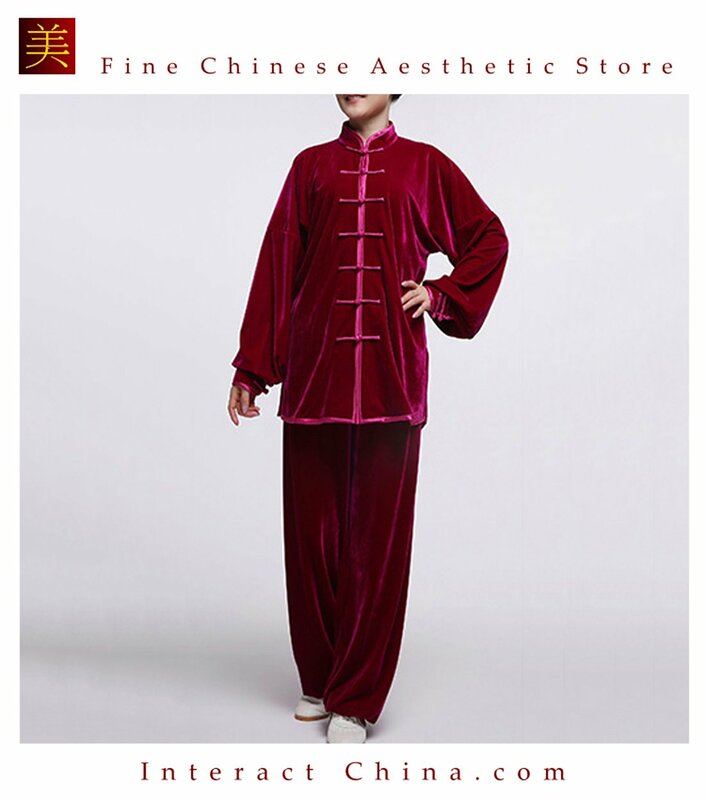 A unisex 100% velvet Tai Chi suit designed for ultimate comfort and performance during martial arts practice. This eye-catching ensemble is stretchy and loose fitting, with a jacket side slit, an elastic waist, and elastic leg bottoms to accommodate a total range of motion. The mandarin collar and handmade frog buttons lend these suits an authentic oriental flavor that is both traditional and modern. These suits come in 11 striking colors. It features double edging on the sleeve and hemming along the jacket's edges, making for a durable fit that will surely last many washes and wears. The pants are designed with practicality in mind too, featuring an inside pocket for your mobile phone or other personal belongings. The warm and flowing material makes this ensemble perfect for martial arts or even for simply comfortably lounging around the house. Care: This suit is machine washable in cold or low temperature ideally at 30 degrees Celsius (86 F) using soft detergent with no chloride. Flat dry or air dry (keeping out of direct sunlight when drying) with steam ironing. This fabric will not shrink and is colorfast. Simply acquire 2+ items per purchase, we will cash rebate you 10% - 20% via paypal! Yes, 90 days! We examine each item carefully and offer full refund or free replacement if item is of inferior quality, defective or not as described. We are verified top-tier Paypal merchant and your purchase is protected by Paypal Buyer Protection Program for up to US$ 2,000.00. Each parcel is shipped registered with its own tracking number. Most destinations takes +/- two weeks to arrive (except custom order). In all circumstances only high quality heavy duty shipping box (thick mailing tube for paintings) are used. We accumulate e-commerce experience since 2004 serving thousands of customers, and are proud of the fact that over 99% of you are happy in shopping with us! Aileen and Norman, co-founders of InteractChina.com, are master graduated couple from University of London who have been fascinated by the richness and uniqueness of ethnic art & crafts. Aileen comes from the Southwest China while Norman has been living in Europe, North America, Hong Kong and China. We are proud of and believe it is meaningful to help ethnic people to preserve their culture and to promote their handicrafts. These people are friendly, have passion for life and are very talented - as reflected from these lovely artworks! Many of these artworks are sold in boutiques shops / high end department stores in London, New York, Toronto and Tokyo at premium price. By leveraging the internet, we are able to bring them to you at a more reasonable price, making it win-win-win for you, us and ethnic people!